Healthy Chunky Monkey Cake just happened!! A soft and springy, moist and delicious, 100% healthy and 110% addictive Peanut Butter Banana Cake with Chocolate Peanut Butter Frosting. And did I mention it’s healthy?? It appears I did, but it’s worth saying twice… because one bite and you’ll never believe it! This hunky slice of heaven is sweetened with fresh, ripe bananas and organic stevia instead of white sugar, brown sugar or corn syrup. And, it’s made with peanut flour instead of bleached all purpose flour. Seriously. No butter, no white sugar and no white flour. 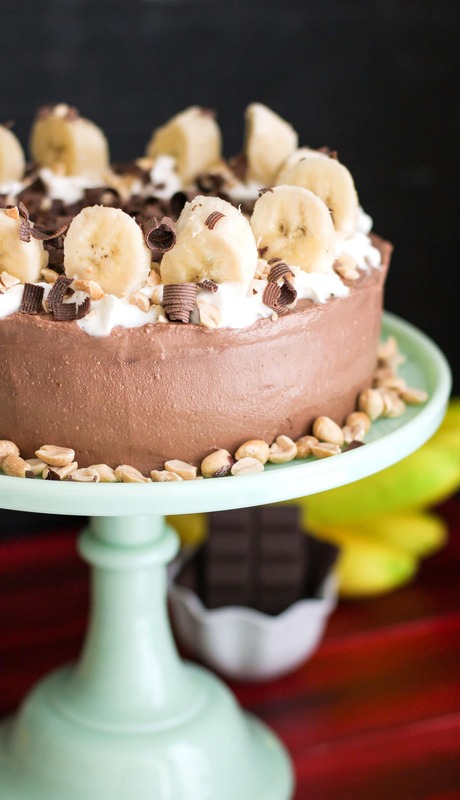 This Healthy Chunky Monkey Cake is a win-win-win-win-WIN all around! 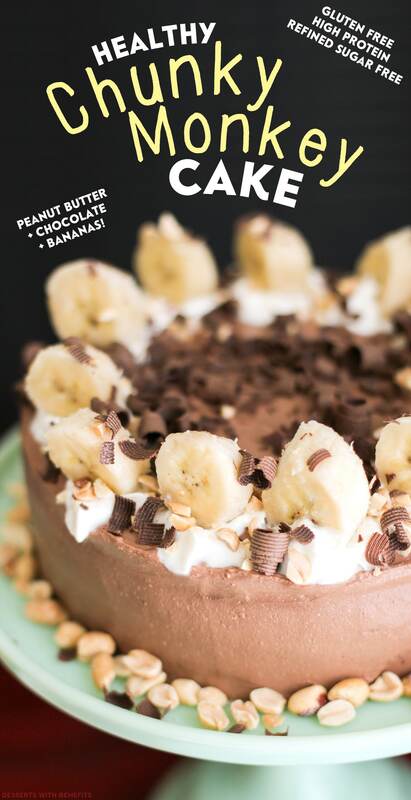 The cake is moist and packed with peanut butter and banana flavor… it’s like banana bread infused with peanut butter. The frosting is thick, fudgy and sweet. Like the stuff out of the tub from the grocery store, but without all the sugar, hydrogenated oil and artificial ingredients. Pair that peanut buttery banana cake with the fudgy chocolatey peanut butter frosting and you’ve got some serious decadence on your hands. And, um, I’m very serious when I say that. This is so good you will want to eat it with your hands… why waste time getting out the utensils? 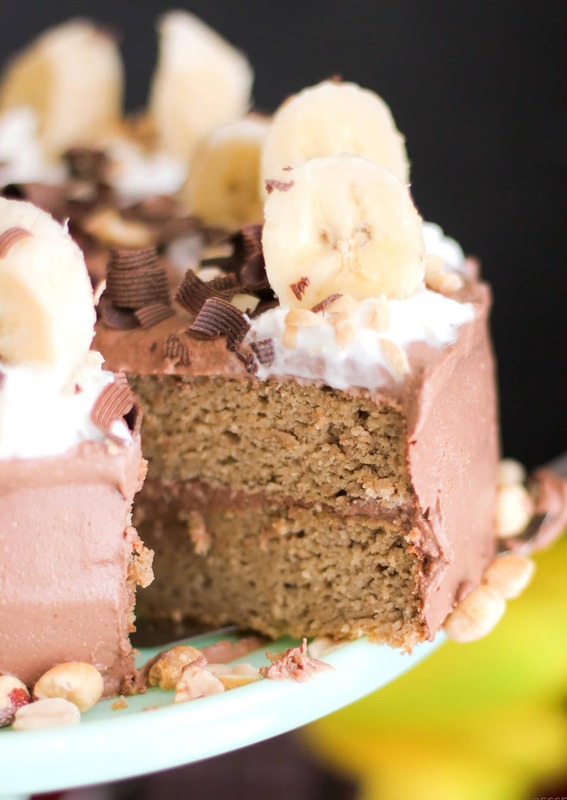 This Chunky Monkey Cake is soft, fluffy, moist and delicious, it tastes too good to be healthy! Preheat the oven to 350 degrees Fahrenheit. Spray two 8" cake pans with cooking spray and line with parchment circle liners. In a large blender (I used my Vitamix), add the frozen bananas. Let it thaw for about 30 minutes, then add the almond milk, vanilla extract and stevia extract. Blend until smooth. Add the eggs and blend again until smooth. Pour the mixture into a large bowl. 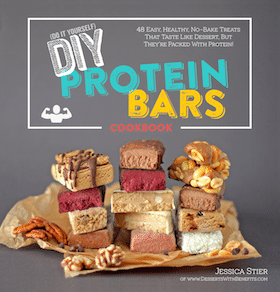 In a medium-sized bowl, whisk together the peanut flour, erythritol, baking powder and salt. Dump the dry ingredients over the wet ingredients and whisk together. Scoop the batter into the prepared cake pans and bake for 40 minutes. 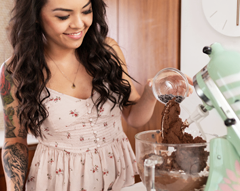 In a stand mixer bowl with whisk attachment, add all of the ingredients and whip on medium speed until completely smooth. Frost the cake, then refrigerate for ~30 minutes to firm up. Serve and enjoy! As a comparison, here is the nutrition label for Bon Appetit’s Banana Chocolate Chip Cake with Peanut Butter Frosting. Hold onto your pants people. The difference is shocking. Everyone was completely shocked and quite honestly, appalled. Whoever made that recipe wasn’t trying to spread the love, more like Type II Diabetes? I don’t think I could ever serve someone a single slice of cake with 1,200 calories, 75g of fat and 81g of sugar (nearly 7 tablespoons). I’d rather serve them a slice (or TWO) of my cake. They’ll be just as happy and just as satisfied eating my (secretly healthy) cake as the other cake. And I guarantee, they’ll feel a lot better about it too. 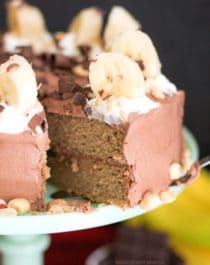 It’s Healthy Chunky Monkey Cake without the healthy taste! Well, would you look at the time. I believe it’s cake o’clock, so I’m gonna grab a slice of this cake right now. Peace out! Just wondering – are all of your recipes going to be grain-free now? Why the change? I am just working on a project (hint hint, COOKBOOK!!) right now where I’m using a lot of oat flour, some brown rice flour, oats and quinoa flakes… so I’m reserving those ingredients for my recipe testing and trial/errors. Could you use an alternative nut flour? Also – could these be made in cupcake form? Peanut flour absorbs a lot of liquid, similar to oat flour and coconut flour (probably due to its high fiber content), so I’ve never come across a good substitute yet. My local grocery store had powdered peanut butter but no peanut flour. Is there a really difference between the two or could I use that? I think powdered peanut butter and peanut flour is the same thing. I think PB2 is powdered peanut butter, and it’s just like the peanut flour I use except it has added sugar and salt. I love this! The idea of taking an ice cream flavor and making it a cake is so cool! 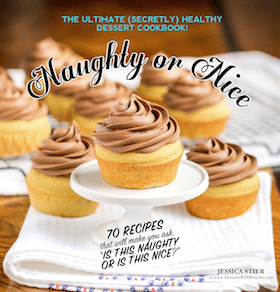 Maybe you can try Rocky Road or Moose Tracks cake next! Awww thank you so much Emily!! And you are a genius. Rocky Road Cake? MOOSE TRACKS?? OHMIGOD. I love the idea of using greek yogurt as a frosting- I recently made a tiramisu with greek yogurt instead of whipping cream! It turned out great. I can’t tolerate stevia, and most of your recipes call for it. What would you recommend subbing for it? It gives me the worst stomach pains! It really depends on the recipe though. Do you have a specific recipe in mind? Stevia is a bit difficult to replace in baked goods, but in no-bake recipes it’s less of an issue. PS: OHHHH my goodness… I just checked out your Mexican Chocolate Tiramisu recipe… IT LOOKS DIVINE! I made this cake but did not have the brand of vanilla stevia Jess suggested so used a different brand and the frosting was horrible -a very strong aftertaste. However, miraculously, the day after, the taste had completely mellowed and it was Fantastic! So my advice to anyone making this cake – use the same brands Jess uses so you don’t have a nasty surprise. It was SOOOOO Yummy. And so guilt free. I shared it at work, and no-one would believe it was sugar free and healthy. Thanks Jess. Oh no! I’m sorry the different stevia didn’t work out 🙁 … although, I’m glad it mellowed out the next day! I made the same mistake once… I bought a large bottle of stevia (because it was on sale) without looking at the ingredients and it had alcohol in it, so NOTHING I used it on tasted normal. I had to throw it away, it was completely useless! I’m afraid there isn’t any substitute for the peanut flour. It absorbs a lot of liquid, similar to coconut flour, it adds a lot of peanut butter flavor, and it doesn’t bake the same as other flours. Can “Stevia in the Raw” (in a bag) be used in place of the “Stevia mix” you list? Hmmm, I haven’t tried that but you might be able to try it out… the stevia mix I used is 2x as sweet as sugar, so you’ll need to increase the 1/2 cup to 1 cup. I hope you like the cake! Excellent! There was a Jif brand of the powdered peanut butter that didn’t have the added sugar and salt that the PB2 did, so maybe I’ll go back and pick that up. Thanks! Can’t wait to try out the recipe! It looks so decadent I can’t wait to try it. Since we’re peanut free, I always substitute with “Sunbutter” (sunflower seed). Can the peanut flour be substituted with coconut flour?, and can the stevia be substituted with either honey, pure male syrup, or coconut sugar( usually an identical substitute for brown sugar but healthier)? Hello, I just love all your recipes but I am wondering if I could make my own “sugar” blend, I have stevia and erythritol. Okay I love all your recipes but eggs are not healthy and it says healthy chunky monkey cake so…..
1. Eggs are not the evil villains we thought they were. They are actually very nutritious. 2. There is only a half an egg in each slice in this recipe, so it’s not like you are eating a dozen eggs at a time here. 3. If you still hate eggs, substitute flax eggs instead. Problem solved. Great idea with the frosting by the way, that’s genius! I’m using the frosting recipe as a dip for fruit (bananas, apple slices, strawberries). Yum! Healthy without the healthy taste- that’s my jam! I’m seriously drooling over this beauty. I’ve gotta try this ASAP. could I possibly replace the stevia extract with honey? I just stumbled on this today looking for ways to use up my banana’s and I’m going out shopping for the ingredients I don’t have. I’m curious why the frozen banana’s. Have you tested with a “fresh” mash, and if so how did they differ? I look forward to poking around in your other recipes too. Hope you like the cake and my other recipes! !